Adforest classfieds theme review – good! Adforest is a fully responsive WordPress theme to build a classifieds website. The theme uses Woocommerce for payments and order emails sent after an ad purchase. Adforest is available in Arabic, Chinese, English, French, German, Russian, Spanish. It is also compatible with the WordPress translation plugin, WPML. This theme uses the page builder WPbakery to make the homepage. Here is how it works. The theme uses the user registration system of WordPress. Then, when a seller wants to buy classified ad space, it goes through the Woocommerce process (originally a free e-commerce shop plugin for wordpress). Consequently, The payment gateways of woocommerce (Paypal, Stripe, 2checkout and many more) can be used to sell classified ads. 18 predefined homepage layouts are delivered with Adforest. This means there are 18 ways of displaying classified ad categories. This is the weak point of many other themes and plugins that only allow 1 way of displaying classified ad categories. We liked Saffran & Prunes layouts because they looked like the Craiglist homepage. It means they display columns in which there are the main category and all subcategories below it. Compared to the free wordpress classified ad plugins, Adforest is much better because you don’t need heavy CSS and PHP customizations to start using it. For every listing, we can see the category and the subcategory at the top of the page. The seller can add several pictures to his classifieds ad. Below the picture area, there are several fields (price, condition, location, type, warranty, date) and then the description. 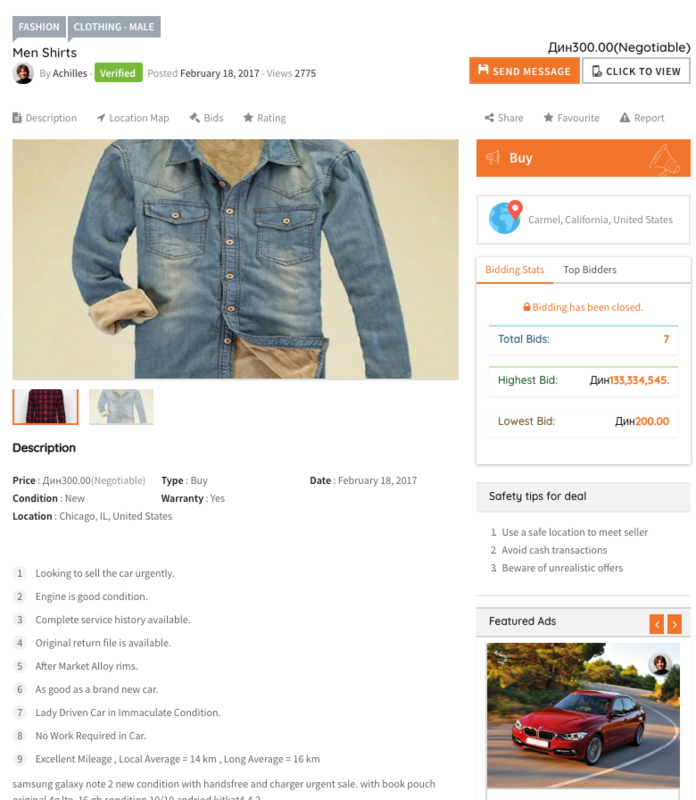 It is possible to send a message to the seller. Thus, the seller isn’t forced to publish its phone number or email address. As you can see below, the Adforest theme features a bidding system. Adforest is the perfect theme to start a paid classifieds ad website. The default theme does not have major issues. With many other classifieds themes like PremiumPress, Classipress, we found that the webmaster had to move the position of different blocks, remove background images and reduce the height of the header. On the other hand, with Adforest, you just need to remove blocks and unnecessary animations using CSS and a child theme file. It means you don’t need to hire a PHP programmer who knows this theme by heart. Being able to install, set up, modify your theme quickly without being forced to hire a 3rd party is priceless. That’s why Adforest is among the best classifieds themes we tested.